Last week, I put hundreds of dollars’ worth of Hay House books, Tarot and Angel Cards in the basement. Why? Read on to find out! Unlike most psychics, I was born a complete sceptic (see my bio).My background is in Agriculture and Environmental Science. I spent my University years poking in craters and completing my Honours at CSIRO, before working with the Australian Government, the UN and Greenpeace. So I’m a lifelong fan of biodiversity, because it’s the secret to a healthy ecosystem.Think about it – the most spectacular gardens have many flowers, not just daisies. And consider your local supermarket – isn’t it depressing when you realise that every detergent you buy is owned by the same company? The same goes with studying spirituality. As many of you know, my friend Butterfly (a Master 33 lifepath) died recently from cancer. See her wisdom and the Kookaburra spirit she sent. When I first found out she was sick, I was stunned, as not only was she vegan and one of the most positive people ever, she was right into Angel Cards and all things psychic. Part of me kept thinking ‘she must have manifested the cancer, surely she can un-manifest it? !’ Wow – how arrogant. Instead of being present with my friend, I was stuck in my head. Although I know people who have used alternative and conventional* means to overcome cancer, there is no one-size-fits-all solution. *Before I became a psychic, I co-raised millions for cancer research, so I have seen all sides of the industry. I kept pondering Louise Hay’s book ‘You Can Heal Your Life’, which suggests that cancer is related to ‘Deep hurt. Longstanding resentment. Deep secret or grief eating away at the self. Carrying hatreds.’ Was that true, or only part of the story? Surely all babies who have cancer aren’t carrying hatreds? And if a city had been exposed to radiation, did only the resentful people get cancer? Can Sickness Be A Good Thing? Eventually, I had the epiphany that, for many years, I have believed that illness and death are a form of punishment, rather than a natural part of life. Yikes, how unrealistic. Surely every saint and guru has caught the flu at least once? That doesn’t make them any less enlightened. Sometimes, falling sick the only way we can connect with certain people to uplift them. Butterfly amazed the nurses in her palliative care ward with her bubbly personality – even while dying, she’d chat away to them and sympathise with their long working hours. I’m sure they will never forget her. To help me grieve, I had several healings and did intense meditation. During these experiences, my Spirit Guides kept showing me a picture of Ronald McDonald, and telling me not to take everything at face value. After all, my psychic readings with thousands of people have shown that 11:11 particularly appears to people with Master Numbers, Starseeds, and those who are at a Personal 9 or 1 year turning point (read more). It’s often a call to study numerology and to check your ‘inner voice-mails’. People who see it frequently come from conservative backgrounds but are called to make career changes after major life events. 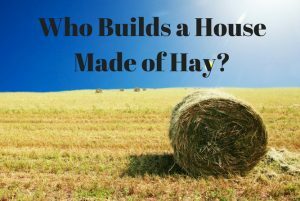 Who Builds a House Made of Hay? -Years ago, I tried to email a manuscript to them, but my file wouldn’t send (read about computer/ Spirit signs here). -When I told a friend I went to the Hay House Writers Workshop, he suggested that was a great way for the company to do market research on other authors, to ensure they stayed one step ahead. -Although I read the hands of Hay House VIPs (which was inspiring), nothing ever came from the meeting. See other readings I’ve done for famous people – I post them as a gift to the community. -For years, I’ve delayed completing a book, because I kept fantasising that Hay House would contact me. One time while I was thinking this, I drove behind a truck filled with bales of hay as it turned down a dirt road. Yep, it led me down the wrong track. -Despite decades of personal growth work, I found myself consistently reading out the descriptions on Hay House Angel cards to my clients, as if I didn’t trust my own interpretation. As the title suggests, I have put all my Hay House items downstairs for now. Look, I have loved all the wisdom gained from their books and events. This post is not meant to sound ungrateful, it’s just a reminder to help the little fish as well. Consistently supporting the biggest company creates a monopoly.It’s like feeding one child more than their siblings – a recipe for injustice. That’s the opposite of what 11:11 is about. 11:11 is a reminder that ‘every one is equal’ and ‘we are all creators’. Before you buy anything (including someone’s opinion of you), ask yourself – is this designed to make love or money? As someone who offers a money-back guarantee on their services, and who gave up a senior fundraising position to start a business, I like to think I’m in the first category. from Hay House, how many independent decks are staying on the shelves? 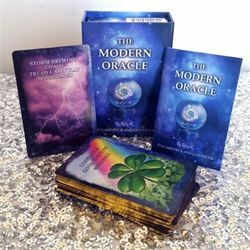 As you can see in my post about my 11 Favourite Tarot Decks there are many Australian alternatives such as Katy-K’s The Modern Oracle. I’ve had many clients praise her cards for their clarity, punch, and user-friendly design. 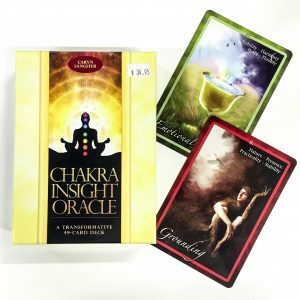 Another beautiful deck is the Australian-designed Chakra Insight Oracle, which is one of the prettiest and most evocative decks I’ve ever used. Please note, these images are affiliate links to my friends at Brisbane’s Tarotopia. I hope this blog has given you food for thought. Perhaps it will mean I will never be a Hay House Author. Oh well. Right now I’m ok with that. Other people can have that opportunity, and I wish them all the best. With a son as cute as Forrest (see pic) I will just have to content myself with his kisses and cuddles. 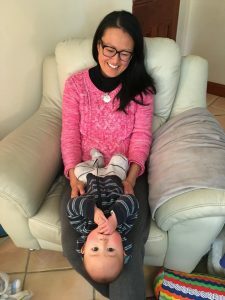 It’s also why I blog about everything under the sun, so people can see that spirituality can be fun – it’s not just about eating mung beans (although they are tasty too). Now that I’ve stopped waiting for someone else’s approval, I can get on with my Master 11 lifepath of being a Spiritual Messenger. And it feels great. -Come to one of my numerology courses or palmistry workshops in Brisbane, I’ll also be creating online and video content in future.